Associate Justice Erlinda Piñera Uy is the first lady justice appointed to the CTA. She was born in Binalonan, Pangasinan, on May 28, 1953 and is married to businessman Michael D. Uy with whom she has two children, Maynard Gregory & Mylene Gertrude. Justice Uy finished her elementary education at the Siena College, her high school education from Grace Christian High School (with Honors), her Liberal Arts Degree (major in Communication Arts) from the University of Sto. Tomas, and her Bachelor of Laws from the Ateneo School of Law (Silver Medalist for 2nd Honor). She has completed the academic requirements of her LLM Course in San Beda College-Graduate School of Law. 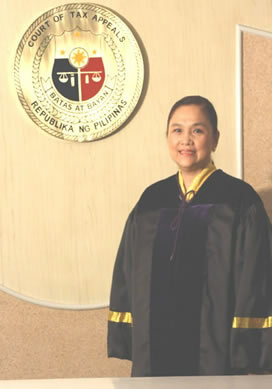 Prior to being appointed as Associate Justice of the CTA on October 5, 2004, she was Presiding Judge of the Regional Trial Court, Branch 162, Pasig City, since July 1, 1999; she was appointed as Executive Judge of Metropolitan Trial Court of Manila on June 15, 1999, appointed as Presiding Judge of MTC Branch 30, Manila, on May 20, 1993; Senior Partner of Piñera Uy & Associates from June 1, 1990-May 1993, Court Attorney II from Nov. 16, 1987 to June 30, 1988 and Technical Assistant from Oct. 1, 1987 to Nov. 15, 1987 both in the Office of Associate Justice Marcelo B. Fernan; Legal Assistant at the Dela Cruz, Rocamora & Associates, Supreme Law Center (1986-1987), VP for Administration, World Marine Dev. Corp. (1978-1981) and Executive Assistant, Super Island Timber Development Corp., 1972-1975. Justice Uy attended various trainings and seminars conducted by the Supreme Court. She also underwent courses on Basic Evidence, National Judicial College, University of Reno, Nevada, U.S.A.; the Role of the Judge in a Juvenile and Family Court as a UNICEF Scholar; Family Justice System in Singapore; & Corporate Taxation, International Aspects of US Income Taxation, Copyright & International Human Rights and Humanitarian Law at the Harvard Law School, U.S.A. Among the citations Justice Uy has received are: the Plaque of Merit as "Regional Trial Court Judge of the Year" in Pasig City on June 27, 2003; Outstanding Alumni Award from Grace Christian High School, Grace Alumni Grand Homecoming on July 9, 2000; and a Special Award of Distinction from the Integrated Bar of the Philippines, Manila II Chapter, on August 12, 1993.